An Indian climber on Sunday reached the summit of Mount Everest for the second time in less than a week, her expedition team said, setting a women’s record for a double ascent of the world’s highest mountain in a single season. Anshu Jamsenpa, 37, returned from the 8,848-metre (29,028-feet) peak on May 16, before turning around after a short rest to repeat the feat. “Anshu reached the summit of Everest at 8:00 am (0215 GMT) today for the second time this season, setting a new record,” said Dawa Lama of Dream Himalaya Adventures. Jamsenpa, a mother of two, was blessed by Tibetan spiritual leader the Dalai Lama before leaving for the expedition. 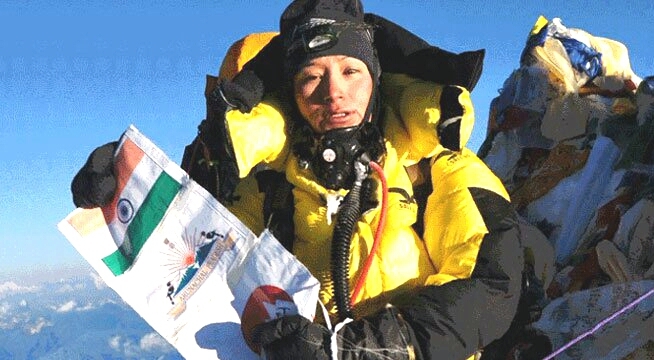 The current female record, certified by Guinness World Records, is held by Nepali climber Chhurim Sherpa, who in 2012 become the first woman to scale the peak twice in a season. Jamsenpa has climbed Mount Everest five times. She intended to make the summit in 2014 but the climbing season was cancelled after an avalanche killed 16 Nepali guides. Another attempt the following year was foiled after an avalanche — this one triggered by a massive earthquake that left swathes of Nepal in ruins — killed 18 people at Base Camp. Last week Nepali climber Lhakpa Sherpa broke her own record for the greatest number of summits by a woman after scaling the peak for an eighth time. More than 120 climbers have made the summit this season, with the first ascents delayed by high winds, fresh snowfall and unusually cold temperatures. There are concerns a high number of summit permits issued by Nepal could cause dangerous “traffic jams” on the mountain as climbers target a brief window of favourable weather before the monsoon in June. This year’s climbing season has already been marred by two deaths, including legendary Swiss climber Ueli Steck who fell from a ridge during an acclimatization climb.